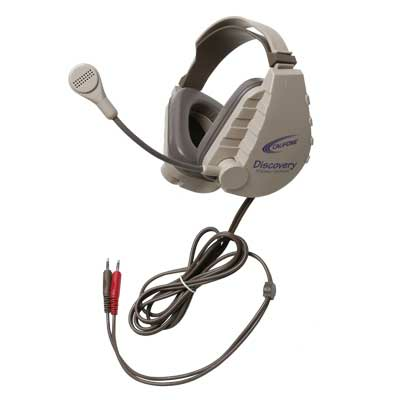 The Discovery™ series of professional-grade headsets are engineered for heavy-duty educational and testimonial uses. They're used by students in K-12 classrooms and labs for language learning, read alongs, science, math and gaming activities. 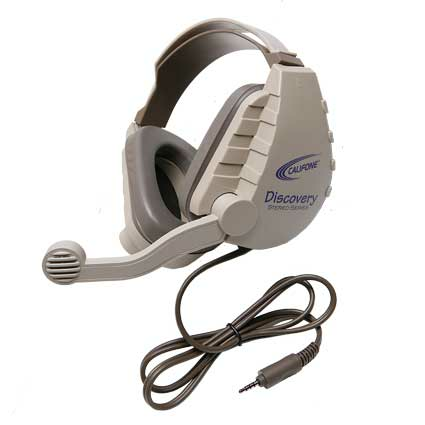 Since developing critical listening skills that lead to critical thinking skills is a major objective of the Common Core standards, the Discovery headsets have a built-in noise cancelling dynamic or electret microphone with voice recognition software which allows for vocal response recordings so students can listen to the playback for feedback and to check their progress. With a variety of connecting plug choices, they're compatible with smartphones and tablets, most computers and media players. Discovery headsets are remarkably comfortable because of their extra deep earcup cavities and are very quiet with ambient noise reducing around-ear earcups, which help keep students on task while reducing the need to increase the volume. Beneath their rugged headband is a flexible comfort sling, which contours to the user's head for better weight distribution and balance, also contributing to a more comfortable experience. Volume control is via a dial located on the back of the right earcup. Each headset model has a replaceable 6' cord that can withstand 250,000 flexes, and with a cord change, enables the same headset to operate in either stereo or mono modes for added flexibility. This also allows minor repairs to be made without purchasing a new headset body. Replaceable, easy-to-clean vinyl ear cushions are hypo-allergenic, no latex. The rigid boom microphone can be pivoted up and out of the way next to the earcup when not in use. The boom on all models is rigid except for the DS-4V, whose flexible steel boom is encased in a rugged protective wrap. These headsets are available with different types of headphone and microphone plugs: the DS-4V comes with a 3.5mm headphone plug and 3.5mm mono dynamic mic plug; the DS-8V, which has a 3.5mm headphone plug and 3.5mm stereo mic plug, is available individually and as a 10-pack without a carry case (DS8V-10L); and the DS-9V includes a 3.5mm mono headphone plug and 3.5mm stereo electret mic plug. The DS-8VT has a single, stereo 3.5mm To Go™ plug for iOS & Android-based tablets and smartphones for mobile learning applications. DS8V-USB has a USB plug for Windows & Android-based tablets, Macs, Chromebooks, laptop and desktop computers.